A Jamba Juice in an Oak Park neighborhood shopping center was robbed at gunpoint Wednesday morning. 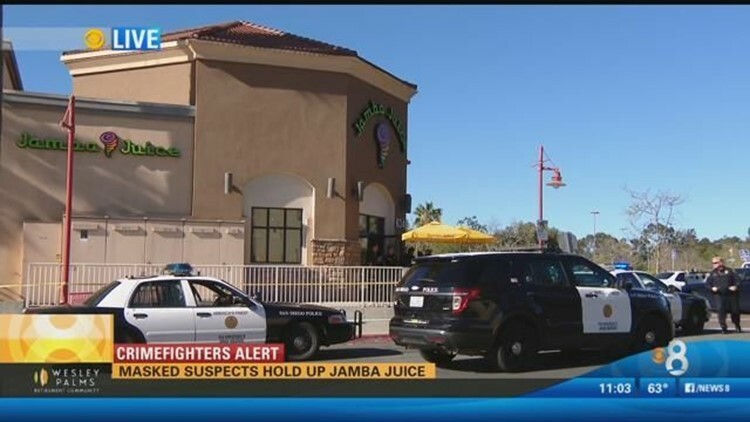 SAN DIEGO (CBS 8/CNS) - A Jamba Juice in an Oak Park neighborhood shopping center was robbed at gunpoint by two masked men Wednesday morning. Two gun-wielding men dressed in desert camouflage gear with their faces covered busted through the front doors and held three Jamba Juice employees against their will with a customer also inside. The suspects demanded cash from an employee at the business located on College Grove Way near State Route 94 shortly before 7 a.m., San Diego police Officer Frank Cali said. They escaped with an undisclosed amount and drove off in a black vehicle, Cali added. Police said the staff members were terrified. "They entered the store and had the employees take them back to the safe and they took an undisclosed amount of money," explained Lt. Steve Behrendt with the San Diego Police Department. Police officers used the LoJack Recovery System to track the getaway vehicle, which is described as a black 2000 Honda Civic. Initial reports indicated that the car could be stolen, although that detail has yet to be confirmed. A Jamba Juice employee helped to identify the car, which was ditched at Bayview Heights Place about two miles from the store off SR-94. Officers planned to impound the car as evidence. Police said they are searching for two Hispanic men described as standing around 5'7" to 5'8" with medium builds. Anyone with information in this case, can call the San Diego Police Department.